I also finally made time to complete the embroidery on some of the merit badges I have earned. The merit badge program has really helped me learn some new skills and have some fun along the way. Beginner: Identify 5 herbs and uses for them and try one. Intermediate: Grow 2 herbs and use them. Expert: Grow 3 more herbs and use them and create gift packs of your own herb blends. Beginner: Research recycling in your area both what can be recycled and where. Intermediate: Set up a recycling system for yourself and use it for a week. Expert: Recycle for one month and teach someone else to do it too. I have earned one more expert level badge and it is the one I am most proud of - at least so far....The category is Each Other: Blogging. Yes, my friends, it was a merit badge that encouraged me to start this blog and I have enjoyed it immensely. Beginner: Read a book titled Blogging for Bliss by Tara Frey and choose a topic you love. Intermediate: Pick a blogging host, pick a name and post your first post. Expert: Learn to add pictures to your blog, publish 10 posts and network with other bloggers. There are so many badges you can earn but, more importantly, each one allows you to add a new skill set to your repertoire. There are over 100 badges and each one has three levels to help you build skills. You can learn to insulate your home, help your community, make bread or cheese, learn how to go "glamping" or any number of stitching and crafting skills. I have several projects in progress and I'll keep you posted. 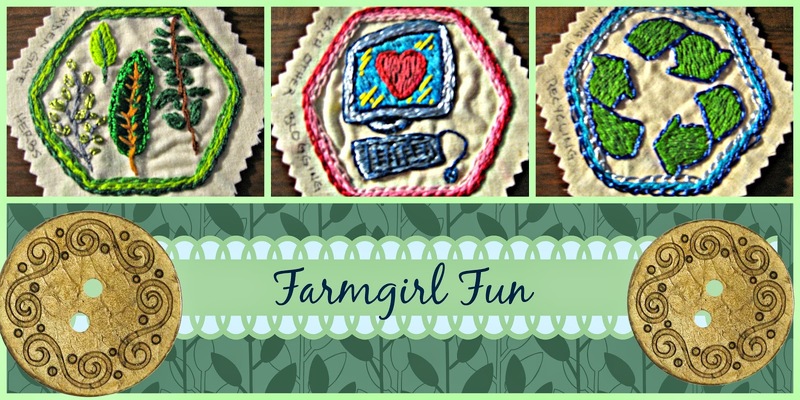 I hope you consider joining the Farmgirl Sisterhood and earn some merits badges of your own. What Farmgirl skill would you most like to learn? Tomorrow is Skills Saturday and I'll review the skill of stocking up on non-perishable foods and how to store them. I hope to see you then! The main ingredient in hand sanitizer is paranoia. I am making a bold statement here that I'm sure won't surprise anyone: I’m not a fan of hand sanitizer. I know that many people carry it around with them and even reflexively use it throughout the day. Schools include it on the list of required supplies but it just seems like a bad idea to me. I used to use it. In fact, when I managed a nursing unit in a hospital, I had hand sanitizer stations installed in the patient rooms, hallways, nursing station and break room. 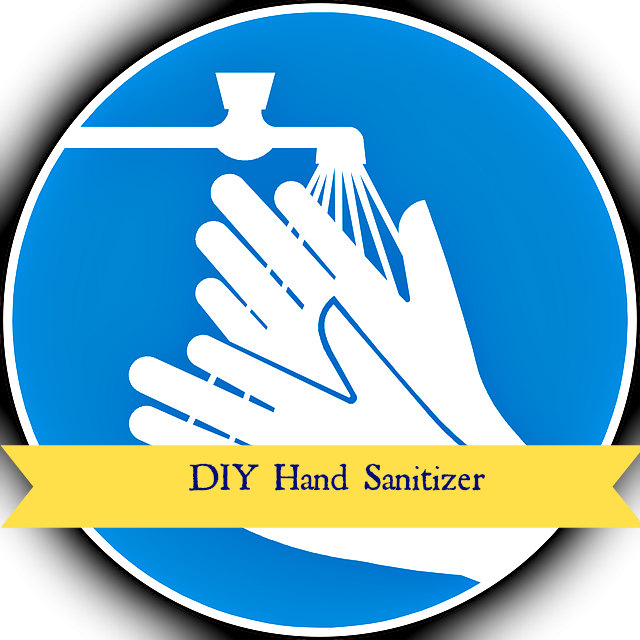 I knew that when I used it, my hands didn't react well – dry, cracked skin and then it would sting like fire but wasn't that a sign that it was killing all the nasty germs? And then one of the containers leaked on the floor. That hand sanitizer dissolved the finish on the laminate floor covering….no wonder my hands were hurting so much! Hand washing is the preferred method for decreasing exposure to pathogens but sometimes it just is not available as quickly as you might want. The commercially available hand sanitizers are not the answer at least for me. There are studies that show that those sanitizers do kill germs – bad ones and good ones too. Those same studies suggest that alcohol based hand sanitizers allow more severe forms of germs to grow on your hands and those germs are more disease causing and antibiotic resistant. Combine all ingredients in a 2 oz. squeeze bottle. Use as you would any other hand sanitizer. Thanks so much for visiting today and considering the switch to hand sanitizers with essential oils. Tomorrow, I’ll share with you some of the farmgirl fun I've had in the past few weeks. I hope to see you then! Benefits of Kefir Milk and How to Make It At Home! Have you seen bottles of kefir yet in your local grocery store? They are popping up everywhere and they are EXPENSIVE. Today, I'll review why you should pass those right by and culture your own kefir at home - your wallet will thank you and so will your digestive system! 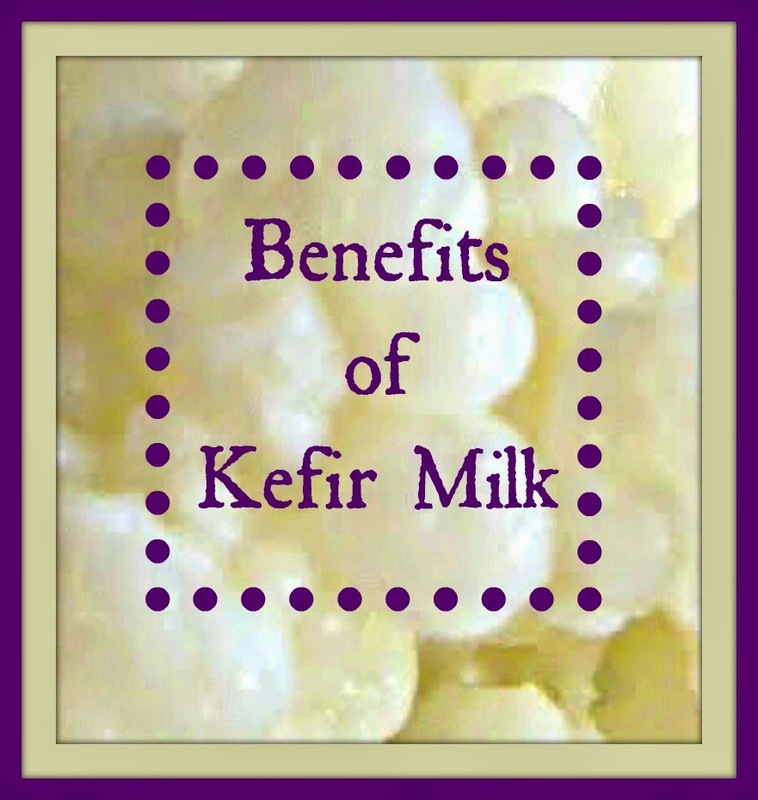 Kefir is a fermented milk product that is a bit like yogurt but even better for you. This drink is full of B vitamins, calcium, magnesium, enzymes and most importantly, probiotics - I mean A LOT of probiotics. Store bought kefir contains about twelve different active bacteria and probiotics which are good for your body. This is compared to yogurt which has only two or three. Home cultured kefir made with kefir grains includes thirty different beneficial bacteria, probiotics and beneficial yeasts to help your body thrive. You might ask why would I want to put more bacteria in my body? That is a good question! The bacteria in kefir (and yogurt too) are the good ones that your body needs to fight off the bad ones that can make you sick. Your digestive system is a key player in the health of your immune system. Regular drinking of kefir is a great way to boost your immunity. How does it taste? Tart like yogurt when you drink it plain but you can mix it in your smoothies or use it in recipes when you might otherwise use yogurt - but don't heat it if you want to preserve all of its live bacteria goodness. Kefir is grown as a culture from Kefir Grains. These grains are not grains like wheat but actually look a like a piece of cauliflower. The grains are a little community of bacteria and yeasts that grow together and fight off harmful microbes that can cause disease. When added to milk, the grains grow and multiply to turn the milk into kefir. Just like when we made buttermilk, it is easy to add the kefir grains to milk and let sit on the counter to culture into one very beneficial dairy food. Put grains in a clean glass jar. Cover with milk. Cover the jar with a cloth or paper towel and secure with a rubber band. Let culture at room temperature for 24-48 hours. Shorter time will result in a thinner consistency and less tartness and longer will be more. When culturing is done, strain out grains and refrigerate the finished kefir. Start a new batch with the grains or cover with milk and refrigerate until ready to culture again. I hope you try this process. 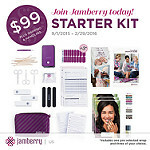 The resulting product has billions of healthy probiotics to help your body. At the very least, have some available to let food be your medicine when tummy troubles find their way to your system. You can have your own little germ-fighting army living in a jar right on your counter! Good broth will resurrect the dead. Bone Broth - it doesn't sound very appetizing but stay with me for a moment. Bone broth has been resurrected as a healing and healthy food to add to your diet regularly. Of course, it is a practice as old as cooking itself. What benefits could be there be for you? There is a lot of nutrition locked inside those bones whether from chicken, lamb, fish or beef. When the bones are long-simmered, nutrients like magnesium, potassium, calcium, amino acids and collagen all become accessible to your body. Getting this nutrition is as easy as sipping a warm mug of broth - maybe even in place of (at least one of) your cups of coffee. :) If you can't see yourself sipping a cup of bone broth, you can use it in your other cooking. Replace the water for making rice with the broth for example. 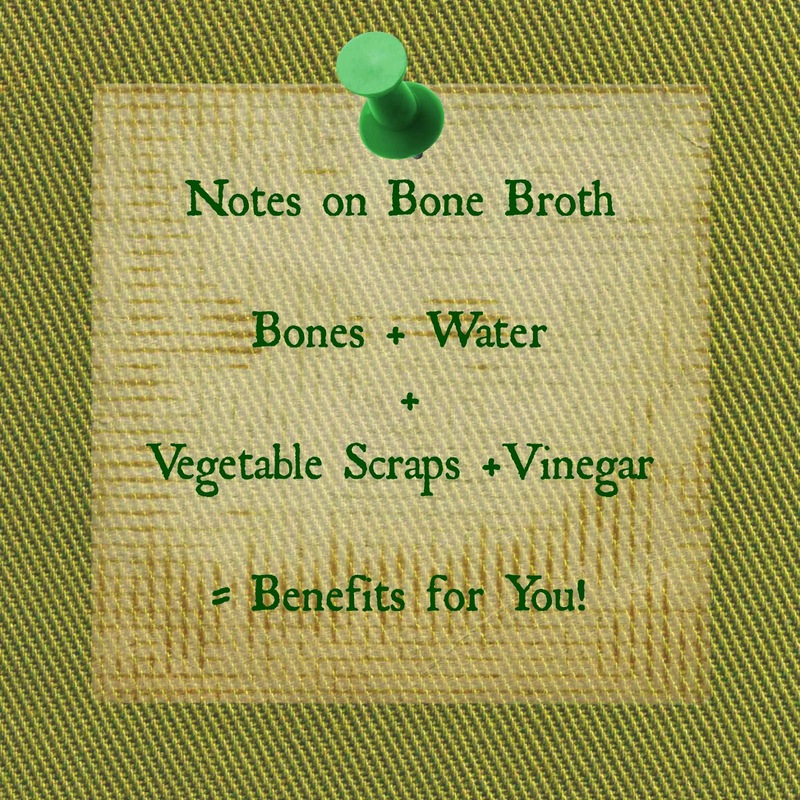 Benefits that have been reported from bone broth are varied but all are linked back to the nutrition in the broth and how easy it is to digest. There are reports that the broth can help leaky gut, joint pain, boost the immune system and decrease inflammation in the body. Regardless of the reported benefits, a cup of this broth is warm and nourishing and it just feels good for you! Place ingredients in crock pot and cook on low for at least 12 hours and up to 72 hours. You want the bones to become soft and crumbly. When that happens, you know you have extracted as much nutrition from them as possible. After cooking, strain broth to remove solids. Refrigerate and the fat will rise to the top to be skimmed off. What remains is clear broth. It may be jelled which shows that collagen was extracted - that is a very good sign! The broth can be sipped from a cup, used as a base for soups or for cooking liquid when you would normally use water. Aim for at least a cup a day. If this post has piqued your interest in this old, nutritious cooking method, I encourage you to read Nourishing Traditions by Sally Fallon which delves into many other traditional foods and cooking methods from around the world. It is a book that I refer to quite often. I'm so glad you stopped by to visit today. I hope you pull out your crock-pot and give bone broth a try. Tomorrow, I'll share my experiences with another old, traditional food: Kefir, a cultured milk product. I hope to see you then! I have to admit when saw the topic for week 10 of Every Monday Matters I was a little underwhelmed. Really, I can make today matter just by changing a light bulb? Huh? There is no doubt that electric lights have changed the world. Having control over light allows humans to work longer and safer. Visibility is increased as well as safety from not using flame powered light sources such as candles and oils. Work can happen before sun up and after sun down inside the home or barn or workplace and streets are safer with outdoor lighting. Not to mention the number of toes that have gone non-stubbed or the monsters that have been chased away from a child's room from the simple addition of the night light. All in all a pretty nifty invention! Have you visited the light bulb aisle at your favorite store lately? There are a ridiculous number of choices but there is one choice you won't have - the traditional incandescent light bulb. Governments all over the world have decided to phase out these bulbs which are not considered to be energy efficient. Product developers are working on more efficient versions even today. The bulb that is generally called upon to replace them is the Compact Fluorescent Lamp, otherwise known as CFL. These bulbs - the ones labeled ENERGY STAR - are reported to use 75% less energy and can last ten times longer. So far, that sounds pretty good! The bulbs stay cooler that other bulbs too, so that's a plus. It is reported that if each US household replaced five incandescent bulbs with CFLs, almost $8 billion of energy cost could be saved in one year. That is pretty impressive too. There are some drawbacks: the bulbs are expensive and the light that is provided is different - harsher and not as warm. There is one HUGE drawback to them though. There bulbs contain MERCURY which is hazardous material and must be disposed of safely. Do Not Throw CFL Bulbs in the Trash! There is a Lowe's less than ten miles from me that will accept CFLs for proper disposal. I will certainly use this service. It is of great concern to me, though, that I did not know about the hazards of disposing CFLs before writing this post. Please spread the word on this issue. We cannot risk mercury contamination of our soil, water or homes. Today, we can make Monday Matter by replacing light bulbs with more energy efficient models AND by teaching others the proper way to dispose of CFLs. That is a great way to Be Intentional! Tomorrow, I will look into the new ( really, the old) trend of using bone broth. The history, the benefits and the instructions on this nourishing product will all be part of the discussion, I hope to see you then! The best comfort food will always be greens, cornbread and fried chicken. For today's post I will share some recipes that use that homemade buttermilk I made (and I hope you made too!). Preheat oven to 425 degrees F. Sift together dry ingredients. Cube the cold butter and work into the flour mixture until it resembles small peas. I like to use a pastry cutter. Mix in buttermilk to make a dough. Knead the dough just a few times to come together. Do not overwork, you do not want the butter to melt from the heat of your hands. Roll out dough to about 3/4 inch thick and cut into biscuit rounds or squares. Place biscuits on a greased baking sheet (use the label from the butter) about an inch apart. Bake for about 15 minutes until lightly browned. Mix together buttermilk and salt and pour over chicken pieces making sure all are covered. Cover and refrigerate for at least one hour. Mix together flour and spices in a bowl or bag. Take individual chicken pieces from the buttermilk and toss in the flour mixture. Heat vegetable oil to 360 degrees Fahrenheit. Brown and cook chicken pieces until internal temperature reaches 165 degrees F. Do not crowd the pan - I fry in two pans to ensure the chicken has enough room. Put all ingredients in a jar, cover tightly and shake to combine. Refrigerate at least one hour before serving. I'm so glad you took a few moments to visit today. Tomorrow is the day we Make Every Monday Matter and the topic is light bulbs. 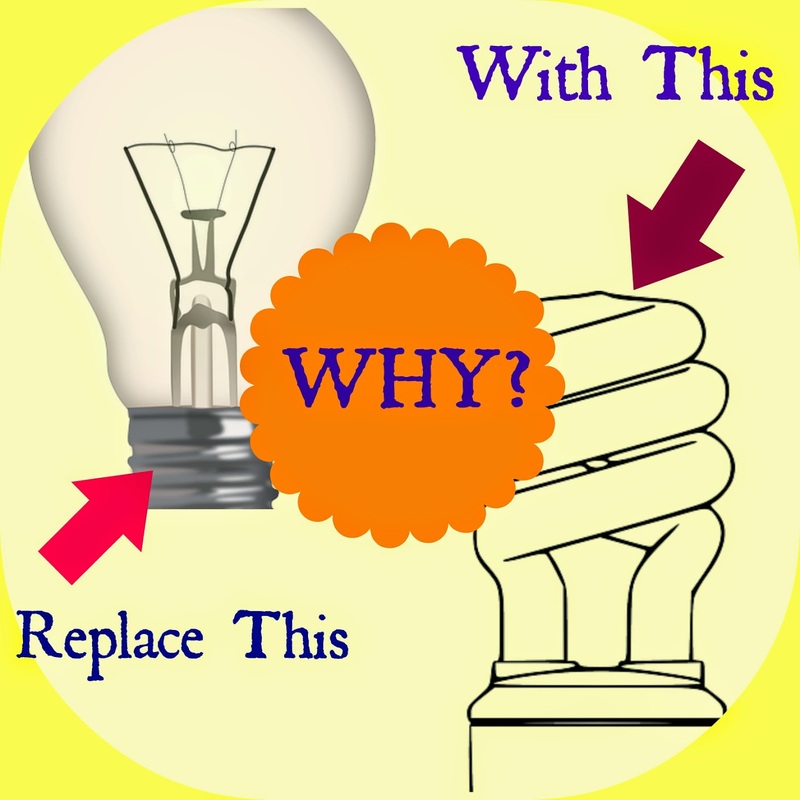 I want to learn the difference between regular bulbs and CFLs and the pros and cons of each. I hope to see you then! the fresh buttermilk pancakes and hot buttermilk biscuits - both made with lard - that were cooked on the top, or in the oven, of that ancient iron stove. Buttermilk has always seemed like a really old-fashioned ingredient to me and anytime a recipe called for it, I did the substitute thing of putting vinegar or lemon juice in milk and letting it sour. I didn't see any reason to buy a little buttermilk from the grocery for just a certain recipe when I knew I wouldn't use the rest of it. In fact, I grew up thinking I didn't like buttermilk at all - thanks to a little switch-a-roo my grandfather played on me. I was thirsty and asked for a glass of milk. He asked me if I wanted "Pappaw's Milk" and of course I said yes. The resulting big drink that followed was an enormous surprise to say the least. Did you know that there are different kinds of buttermilk? 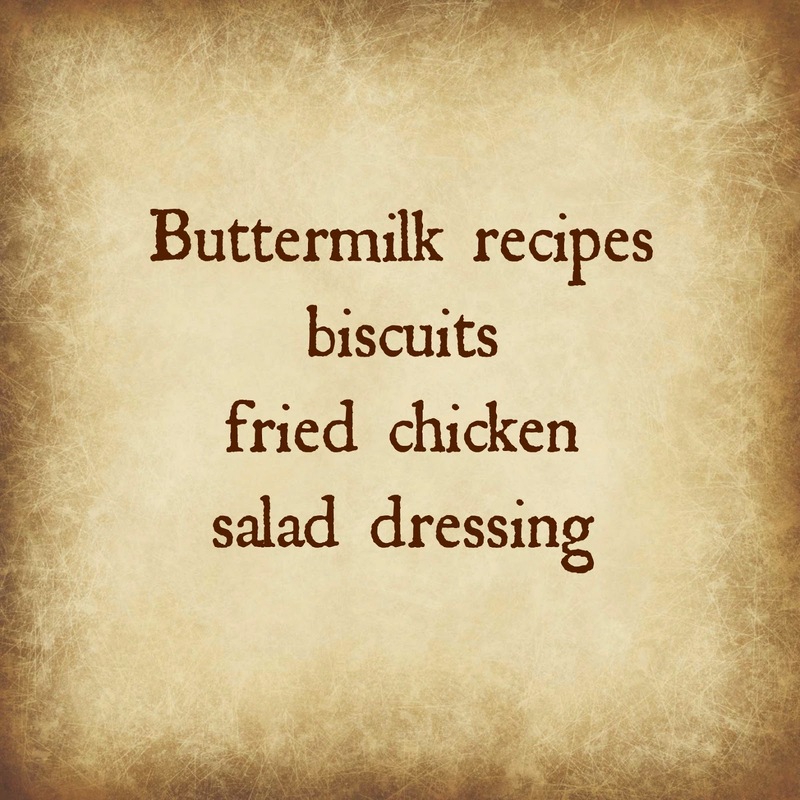 Originally, buttermilk was the liquid left behind after churning butter from cream. This is called traditional buttermilk or old-fashioned buttermilk and is good to use as the liquid in pancakes or waffles. It is a thin liquid flecked with tiny butter pieces. And then there is the tart, delicious creation of cultured buttermilk which is nothing like the traditional one. This one is thick and tart in a good kind of way. If you like yogurt or kefir, you will probably like cultured buttermilk too. In my hobby farm quest to make more things myself, I have already been making other cultured dairy products (thanks to the great milk I get from Pasture's Delights). Cultured buttermilk was next on the list. or purchase cultures (Cultures For Health or New England Cheesemaking Supply Company are two good resources). Let sit to culture for 24 hours, remove cloth and switch to regular lid. Refrigerate and use within 7 days. Save some of this batch to get your next batch going! Making real, cultured buttermilk is one of those skills that takes very little active working time and gives you very useful results. There are many recipes that use buttermilk and I know your recipe repertoire will expand when you have buttermilk readily available in your refrigerator - I know it has happened like that for me. I'm so glad you came by to visit today. Tomorrow, I'll share a couple of my favorite recipes that use cultured buttermilk. I hope to see you then! 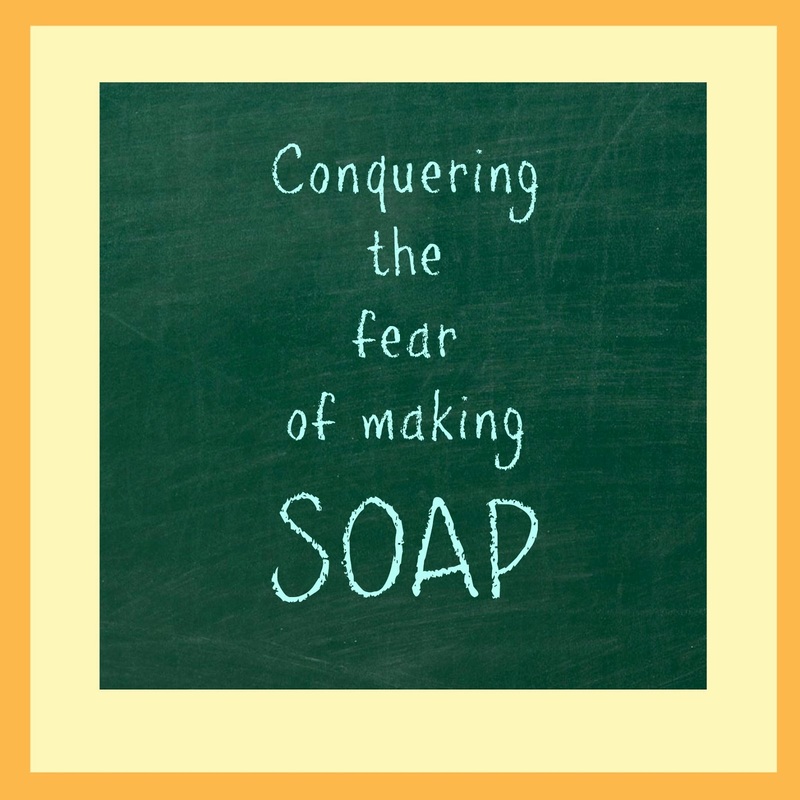 Farmgirl Friday: Time to Conquer My Fear of Making Soap! Hello! Welcome, I'm so glad you stopped by today. I have a confession to make: I am afraid to make soap. Sounds ridiculous doesn't it? I drink raw milk; I've killed a chicken; I empty mouse traps; I've even once punched a bull in the nose for knocking me down - in short, I've done many things that this city girl turned hobby farmer never thought I would do but one thing eludes me...the courage to make soap. I'm talking about real soap - not that melt and pour stuff. My sister makes soap and some pretty good soap at that. I could go ahead and get soap from her since I want to avoid some of the ingredients in commercial soaps but now it has become a personal hurdle that I need to overcome. Go ahead and look at the label on the bars of soap you have in your cabinet...do you know what all those things are? I'm looking at a label right now...petrolatum, polyquaternium-6, pentasodium pentetate, hydroxypropyl methylcellulose, pentaerythrityl tetra-di-t-butyl....absolutely frightening when you consider that you are putting these chemicals all over your body day after day. I've been on a quest to get our foods in as natural state as possible. I've done the same with the household cleaners. The time has come to make soap. Making soap is hard ~ Is it really any harder than pressure canning foods? I used to be afraid of that too! Making soap costs a lot ~ Getting the chicken coop up and running cost more than I thought it would, but the fresh eggs are absolutely worth it...and honestly, once I have the equipment to make soap, I can use it over and over. Homemade soap is hard on your skin ~ From what I've been reading, old-time soap was harsh because the ingredients were inconsistent from batch to batch. I have a better source of ingredients now. Working with lye is dangerous ~ okay - this is probably the real reason I haven't made soap. Working with lye IS dangerous but, with the right precautions, it can be managed safely. There are a lot of soap recipes on the internet. I can't figure out which one is best. ~ yep, there are many recipes out there just like there are for baking bread, making vegetable soup or even meatloaf...just pick a basic one and do it! Do you have any fears like mine? Do you want to learn to make soap with me? I'm making the commitment to do it and I hope you will too. I am really looking forward to adding Soap-maker to my list of hobby farm skills and happy that I can share the journey with you. Plus I want to earn that Intermediate level Going Green merit badge. I'll keep you posted on my progress. 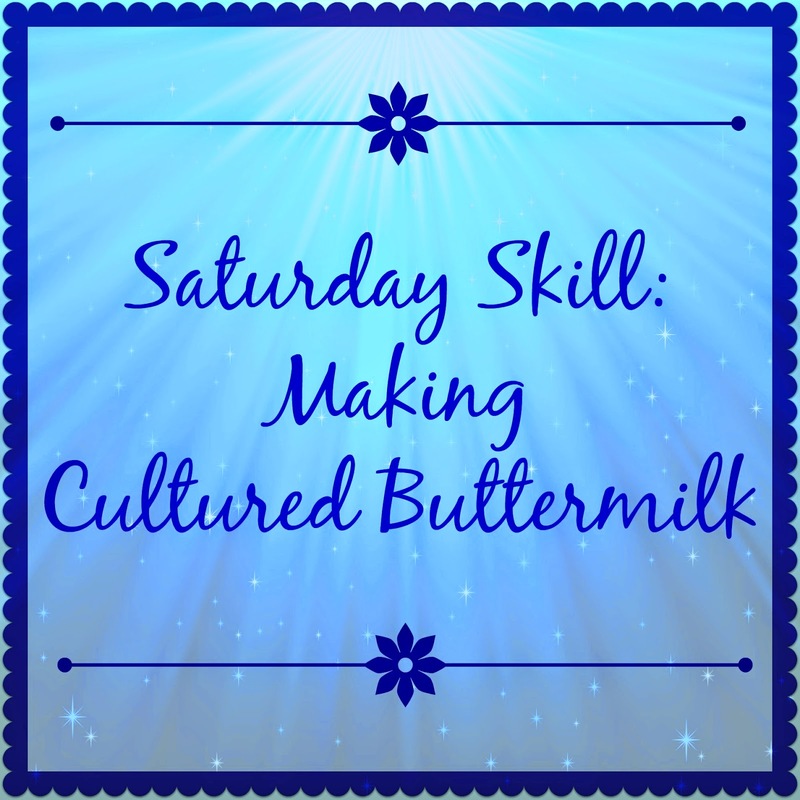 Tomorrow is Skills Saturday and I will teach you how to make buttermilk. I hope to see you then! Feed the birds: It's good for YOU!